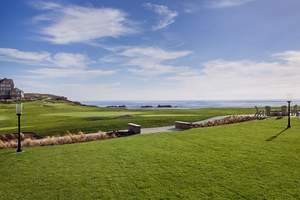 HALF MOON BAY, CA--(Marketwired - Sep 8, 2015) - The Ritz-Carlton, Half Moon Bay unveils a new outdoor venue -- the Mar Vista Lawn. Featuring 7,500 square feet of flexible open air space, the Mar Vista Lawn is adjacent to the Northern California resort's private Ocean House and steps away from its main building. A perfect alfresco space for cocktail receptions, themed dinners, wedding ceremonies and receptions, Mar Vista Lawn features a large grass space and an intimate seating area with Adirondack chairs and gas burning fire pits. Mar Vista Lawn makes for amazing team bonding experiences, including wine workshops or cooking classes. The wine workshops range from wine blending to aroma and color identification workshops. In the wine blending session, participants create their own blends in a sophisticated, yet fun atmosphere. Characteristics of each grape are discussed, showcasing what each grape brings to the blend, and successful winemaking techniques. Participants experiment with different proportions, making a unique blend to take home. In the color identification program, wines are served in black wine glasses and guests try and identify the color, while in the aroma identification session, resort guests are guided by a sommelier as they sharpen their identification skills and have fun learning to recognize common wine aromas. The cooking classes are a fun and tasty experience where guests work in small teams to create culinary masterpieces. From casual cooking to "Iron Chef"-style challenges are offered. Situated 23 miles southwest of the San Francisco International Airport, The Ritz-Carlton, Half Moon Bay provides a magnificent backdrop for the perfect meeting or event along the Northern California coast. The resort offers more than 17,000 square feet of indoor function space, four outdoor venues that can accommodate up to 600 guests, as well as a dedicated conference concierge. The Ritz-Carlton, Half Moon Bay combines ideal venues with impeccable service to produce unforgettable meetings. Situated 23 miles southwest of the San Francisco International Airport, The Ritz-Carlton, Half Moon Bay is a 261-room destination spa and golf coastal resort, and the San Francisco Bay Area's only oceanfront resort. Set atop a rugged bluff overlooking 50 miles of pristine California coastline, the timeless oceanfront estate provides guests with a relaxed yet refined experience, whether for a romantic getaway, meeting or special event. For information, please contact the resort directly at 650-712-7000. For reservations, contact your travel professional, visit www.ritzcarlton.com/HalfMoonBay or call Ritz-Carlton worldwide reservations at 800-241-3333. The Ritz-Carlton Hotel Company, L.L.C., of Chevy Chase, Md., currently operates 88 hotels in the Americas, Europe, Asia, the Middle East, Africa, and the Caribbean. More than 30 hotel and residential projects are under development around the globe. The Ritz-Carlton is the only service company to have twice earned the prestigious Malcolm Baldrige National Quality Award which recognizes outstanding customer service. For more information or reservations, visit the company web site at www.ritzcarlton.com, and for the latest company updates, visit news.ritzcarlton.com. The Ritz-Carlton Hotel Company, L.L.C. is a wholly-owned subsidiary of Marriott International, Inc. (NASDAQ: MAR). The Ritz-Carlton, Half Moon Bay unveils a new outdoor venue -- the Mar Vista Lawn. Featuring 7,500 square feet of flexible open air space, the Mar Vista Lawn is adjacent to the Northern California resort’s private Ocean House and steps away from its main building.